In Chapter 4 from Spreadable Media: Creating Value and Meaning in a Networked Culture, amongst the topics discussed by Henry Jenkins, Sam Ford, and Joshua Green, are fandoms, and participatory culture, and the nature of the relationship between the fandom culture and the corporate culture that owns the base material. I’ve seen this personally through watching various fan communities. One instance is the vast array of Star Trek fan series, made by fans, taking place within the Star Trek universe. Many are high quality and have high production values, the group above even recreated the bridge set from the Original Series. What is interesting is how the copyright holder, CBS, responded – it has allowed the proliferation of these series, as long as they do not make a profit from it, a sort of indirect approval, though not an engagement. However, stakeholders outside of the corporate sphere, such as some actors who had guest roles, or people involved in writing original stories have contributed their services, playing guest roles in some of the higher profile fan series, or even contributing a script that never made it to screen originally. 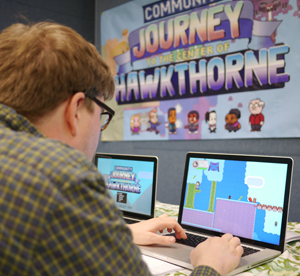 Another example is the “Journey to the Center of Hawkthorne” video game, inspired by an animated episode of Community that was animated ala an early video game. Fans came together to develop the concept into an actual game, as a community. As a lurker on their reddit myself, I’ve been fascinated by the organization and interaction of the community members, and the ways in which they participate. They have systems of participation, with tasks for people with coding skills and those without, and just by playing the versions coming out and finding bugs, people are are consumers are also contributing to the community. Likewise, NBC and Sony, the copyright owners have not stopped the project (which is non profit), but neither have they directly approved it. Though some people involved with the show, like writer Megan Ganz, and several of the actors have mentioned the game and tweeted about it. The question here, is how should media companies respond? They may be hampered by directly encouraging it for legal reasons, but they should use it in some way. Can this value be counted, even if it cannot be directly harnessed, or counted into ratings? How do and how can media companies take the depth of their fandoms into account when making business decisions?